Provided by the National Center for Biotechnology Information (NCBI), BLAST is a sequence homology search program that finds all the sequences that match a particular given sequence from a database, and it is considered the most fundamental tool in bioinformatics today, although there are many other similar programs for different cases. I'm not going here to review the huge literature on sequence/string matching, for what any simple search in any search engine would get you a lot of resources to start. search outputToFile: 'blast-query-result.xml' contents: search result. For my application I wanted to display BLAST summaries because we track some history data in the Nuccore database. If you, as a good bioinformatician, have downloaded the BLAST XML files you may find a summary of each BLAST is found in the header. As we may have several BLAST files, processing entirely each one just to read the header is a waste of time, so we need to parse a XML up to a particular node is found, which is provided by the BioSmalltalk API using StAX parser (XMLPullParser) as backend. 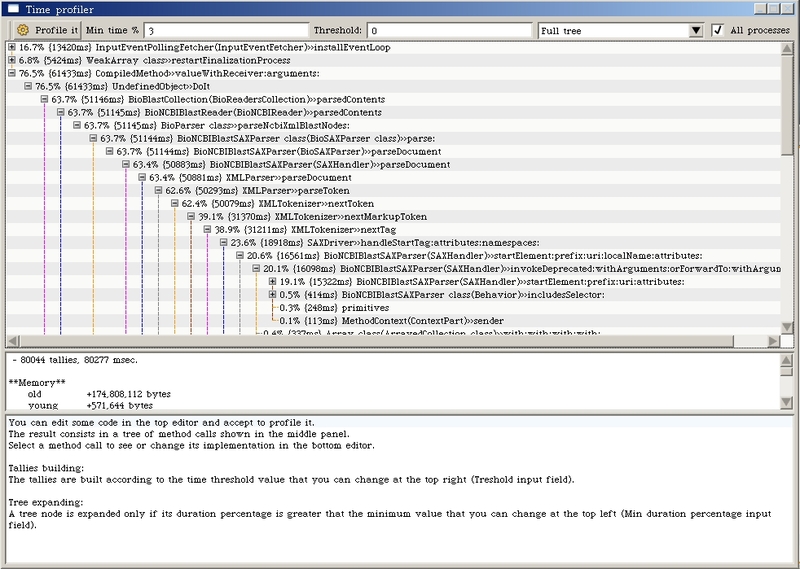 Now, compare the time spent reading a whole XML file versus just stopping after the last header node is found. timeToReadFile :=   [ blastReader := BioNCBIBlastReader newFromXML: fileLocation ] timeToRun. 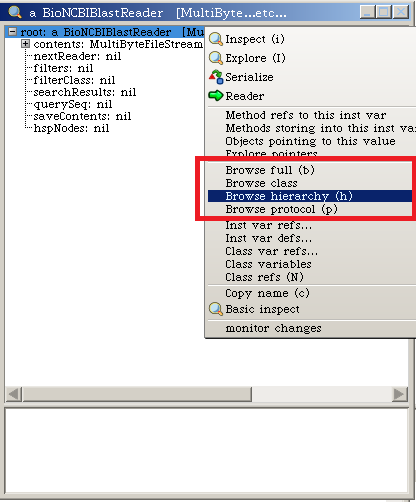 timeToProcessNode :=  [ output := blastReader blastProgramName ] timeToRun. timeToReadFile :=   ( Duration milliSeconds: timeToReadFile ) asSeconds. timeToProcessNode :=  ( Duration milliSeconds: timeToProcessNode ) asSeconds. time := [ blastReaders := BioBlastCollection filesFromXMLDirectory: 'Data\BLASTs\'. Transcript show: blastReaders size asString , ' blast XML files were read'; cr. blastHits := blastReaders parsedContents ] timeToRun. ( BioBlastCollection filesFromXMLDirectory: 'Data\BLASTs\' ) parsedContents. 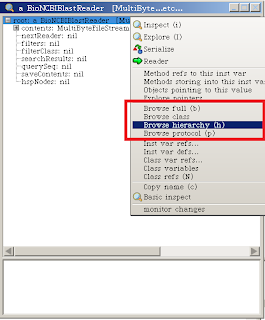 just right-click the selected line and select "Profile it" as shown in the screenshot. after execution, the Time Profiler is open with detailed information of time spent in each method so you may see where to look better for bottlenecks. objectToSerialize := Array with: 'hello' with: (FileStream readOnlyFileNamed: 'GGA28.fa') contents. substituteBy: [ :o | o zipped ]. aMaterialization := FLMaterializer newDefault materializeFrom: aStream binary. zippedStrings := aMaterialization objects select: [:o | o isString and: [ o isDNASequence ]]. unzippedStrings := zippedStrings collect: [:o | o unzipped ]. Looking at the possibilities, many of the custom DNA compression algorithms (or even XML) could be attached and used if saving space is becoming an issue in your bioinformatics experiments. 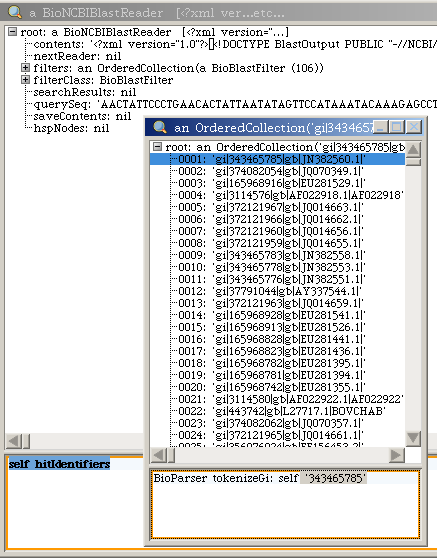 multiFasta := BioParser parseMultiFasta: ( BioFASTAFile on: 'DNANumbers-Sequences.fasta') contents. ( multiFasta renameFromDictionary: hashTable ) outputToFile: 'Renamed-Sequences.fa'. You will notice a pattern here. In the reading of the FASTA file, the message sent is prefixed with #parse, while the CSV file is "parsed" through #tokenize. This is because in BioSmalltalk we distinguish between two modes of parsing. 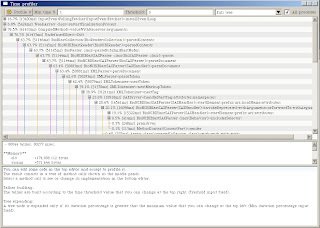 The tokenize messages always answer a Collection-like object containing other collections or primitive Smalltalk objects (this is something like #('object1' 'object2')), while the parse messages answer BioObject's, which could be sometimes "expensive" objects but it could be useful if you need to keep working with bio-objects and to learn relationships between them. In this case we needed a BioMultiFastaRecord because we wanted to rename the identifiers and output its contents to a new file, but for the CSV we only needed to tokenize it as a Dictionary (or hast table). Another little thing to take into account, you are responsible to specify the delimiter of your CSV file, this will be the case until someone implements a pattern recognition algorithm for CSV files. idSubset := #(1 2 5 7) collect: #asString. BioParser parseMultiFasta: ( BioFASTAFile on: 'BioSmalltalkTestFiles\Test-Sequences01.fasta' ) contents. note the following differences with the BioPython accepted script. In BioSmalltalk instead of specifying parameters for formats in Strings like 'fasta', we use a BioFASTAFile object, this not only prevents typos in parameters (and even in the case of a class name typo, the syntax highlighter will notify you in bold red typography that the class is not recognized), but also decouples the file with the parser, enabling to use the fasta file as an real object, and perform validity checks for example in the class. opening a file with a "w"rite mode isn't something that a developer must know, mostly we just want to write the results in a file name, not dealing with handles(?) or write modes. select: [: fRecord | idSubset includes: fRecord sequenceName ] ) outputToFile: 'Filtered-Sequences.fa'. My first entry is dedicated to some basic Sequence String manipulation, to get some familiarization with basic Smalltalk objects. The important thing is that you don't need to create files to evaluate the following expressions, you just select it and "print it" the result with the contextual menu option or just the keyboard shortcut. Note that as everything is an object, you could select again the answer and "explore it" again and again. 'a' asAminoacidName.    " --> 'Alanine' "
'G'asAminoacidName.    " --> 'Glycine' "
'atcggtcggctta' hasAmbiguousDNABases.        " -> false "
'atcggfcggctta' hasAmbiguousDNABases.        " -> true "
" --> #(7 15 16 23) "
and of course, you could use the impressive amount of features of the String hierarchy. 'AATGATCGATGCTAGTCGACA' size.  " -> 21 (a SmallInteger) "
" -> false (a False) "
" Find the position of the first (answer 0 if doesn't) subsequence passed as parameter "
'AATGATCGATGCTAGTCGACATGCTA' findString: 'TGCTA'                   " -> 10 "
And that's all for now, as I don't like long posts we will stop here and I will check the feedback if any, hopefully I will receive comments about what people would like to use.